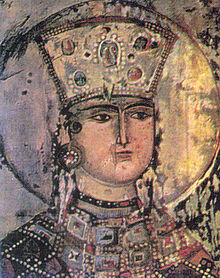 Tamar the Great (Georgian: თამარ მეფე) (c. 1160 – 18 January 1213) reigned as the Queen of Georgia from 1184 to 1213, presiding over the apex of the Georgian Golden Age. A member of the Bagrationi dynasty, her position as the first woman to rule Georgia in her own right was emphasized by the title mepe ("king"), afforded to Tamar in the medieval Georgian sources. Tamar's youth coincided with a major upheaval in Georgia; in 1177, her father, George III, was confronted by a rebellious faction of nobles. The rebels intended to dethrone George in favor of the king's fraternal nephew, Demna, who was considered by many to be a legitimate royal heir of his murdered father, David V. Demna's cause was little but a pretext for the nobles, led by the pretender's father-in-law, the amirspasalar ("high constable") Ivane Orbeli, to weaken the crown. George III was able to crush the revolt and embarked on a crackdown campaign on the defiant aristocratic clans; Ivane Orbeli was put to death and the surviving members of his family were driven out of Georgia. Prince Demna, castrated and blinded on his uncle's order, did not survive the mutilation and soon died in prison. Once the rebellion was suppressed and the pretender eliminated, George went ahead to co-opt Tamar into government with him and crowned her as co-ruler in 1178. By doing so, the king attempted to preempt any dispute after his death and legitimize his line on the throne of Georgia. At the same time, he raised men from the Kipchaks as well as from the gentry and unranked classes to keep the dynastic aristocracy away from the center of power. Queen Tamar's marriage was a question of state-importance. Pursuant to dynastic imperatives and the ethos of the time, the nobles required Tamar to marry in order to have a leader for the army and to provide an heir to the throne. Every group strove to select and secure the acceptance of its candidate in order to strengthen its position and influence at court. Two main factions fought for the influence in Tamar's court: clan of Mkhargrdzeli and Abulasan. The faction of the Abulasan won, the choice was approved by Tamar's aunt Rusudan and council of feudal lords. Their choice fell on Yuri, son of the murdered prince Andrei I Bogolyubsky of Vladimir-Suzdal, who then lived as a refugee among the Kipchaks of the North Caucasus. They called an influential person in the kingdom, the great merchant Zankan Zorababeli. He was given the mission of bringing the bridegroom to Tbilisi. 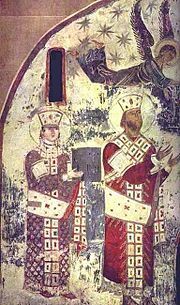 He fulfilled his mission with zeal, the prince was brought to Georgia to marry the queen in 1185. The young man - valiant, perfect of body and pleasant to behold - Yuri proved to be an able soldier, but a difficult person and he soon ran afoul of his wife. The strained spousal relations paralleled a factional struggle at the royal court in which Tamar was becoming more and more assertive of her rights as a queen regnant. The turning point in Tamar's fortunes came with the death of the powerful Catholicos-Patriarch Michael whom the queen replaced, as a chancellor, with her supporter, Anton Gnolistavisdze. Tamar gradually expanded her own power-base and elevated her loyal nobles to high positions at the court, most notably the Mkhargrdzeli. The question of liberation of Armenia remained of prime importance in Georgia's foreign policy. Tamar's armies led by two Christianised Kurdish generals, Zakare and Ivane Mkhargrdzeli (Zakarian) overran fortresses and cities towards the Ararat Plain, reclaiming one after another fortresses and districts from local Muslim rulers. In 1206 the Georgian army, under the command of David Soslan, captured Kars and other fortresses and strongholds along the Araxes. This campaign was evidently started because the ruler of Erzerum refused to submit to Georgia. The emir of Kars requested aid from the Ahlatshahs, but the latter was unable to respond, it was soon taken over by the Ayyubid Sultanate In 1207. By 1209 Georgia challenged Ayyubid rule in eastern Anatolia and led liberational war for south Armenia. Georgian army besieged Ahlat. In response Ayyubid Sultan al-Adil I assembled and personally led large Muslim army that included the emirs of Homs, Hama and Baalbek as well as contingents from other Ayyubid principalities to support al-Awhad, emir of Jazira. During the siege, Georgian general Ivane Mkhargrdzeli accidentally fell into the hands of the al-Awhad on the outskirts of Ahlat. Using Ivane as a bargaining chip, al-Awhad agreed to release him in return for a thirty year truce with Georgia, thus ending the immediate Georgian threat to the Ayyubids. This brought the struggle for the Armenian lands to a stall, leaving the Lake Van region to the Ayyubids of Damascus. With this prosperity came an outburst of the distinct Georgian culture, emerging from the amalgam of Christian, secular, as well as Byzantine and Iranian influences. Despite this, the Georgians continued to identify with the Byzantine West, rather than Islamic East, with the Georgian monarchy seeking to underscore its association with Christianity and present its position as God-given. It was in that period that the canon of Georgian Orthodox architecture was redesigned and a series of large-scale domed cathedrals were built. The Byzantine-derived expression of royal power was modified in various ways to bolster Tamar's unprecedented position as a woman ruling in her own right. The five extant monumental church portraits of the queen are clearly modeled on Byzantine imagery, but also highlight specifically Georgian themes and Persian-type ideals of female beauty. Despite Georgia's Byzantine-leaning culture, the country's intimate trade connections with the Middle East is evidenced on contemporary Georgian coinage, whose legends were composed in Georgian and Arabic. A series of coins minted in circa 1200 in the name of Queen Tamar depicted a local variant of the Byzantine obverse and an Arabic inscription on the reverse proclaiming Tamar as the "Champion of the Messiah". In later times, a number of legends emerged about Tamar's place of burial. One of them has it that Tamar was buried in a secret niche at the Gelati monastery so as to prevent the grave from being profaned by her enemies. Another version suggests that Tamar's remains were reburied in a remote location, possibly in the Holy Land. The French knight Guillaume de Bois, in a letter dated from the early 13th century, written in Palestine and addressed to the bishop of Besançon, claimed that he had heard that the king of the Georgians was heading towards Jerusalem with a huge army and had already conquered many cities of the Saracens. He was carrying, the report said, the remains of his mother, the "powerful queen Tamar" (regina potentissima Thamar), who had been unable to make a pilgrimage to the Holy Land in her lifetime and had bequeathed her body to be buried near the Holy Sepulchre. In the 20th century, the quest for Tamar's grave became a subject of scholarly research, as well as the focus of broader public interest. The Georgian writer Grigol Robakidze wrote in his 1918 essay on Tamar: "Thus far, nobody knows where Tamar's grave is. She belongs to everyone and to no one: her grave is in the heart of the Georgian. And in the Georgians' perception, this is not a grave, but a beautiful vase in which an unfading flower, the great Tamar, flourishes." An orthodox academic view still places Tamar's grave at Gelati, but a series of archaeological studies, beginning with Taqaishvili in 1920, has failed to locate it at the monastery. ^ Pennington, Reina; Higham, Robin D.S. (2003). Amazons to Fighter Pilots: A Biographical Dictionary of Military Women. 2. Greenwood Press. p. 428. ISBN 0313327084. Retrieved 17 January 2018. ^ Rapp 2003, p. 338. ^ a b c Eastmond 1998, p. 109. ^ a b c d Eastmond 1998, p. 94. ^ Toumanoff 1966, "Armenia and Georgia", p. 623. ^ Allen 1971, p. 104. ^ Machitadze, Archpriest Zakaria (2006), "Holy Queen Tamar (†1213)" Archived 2008-05-17 at the Wayback Machine, in The Lives of the Georgian Saints Archived 2008-06-14 at the Wayback Machine.pravoslavie.ru. Retrieved on 2008-07-21. ^ (in Greek) Ἡ Ἁγία Ταμάρα ἡ βασίλισσα. 1 Μαΐου. ΜΕΓΑΣ ΣΥΝΑΞΑΡΙΣΤΗΣ. ^ Eastmond 1998, p. 108 (Footnote #49). ^ Toumanoff 1940, p. 299 (Footnote #4). ^ Khazanov & Wink 2001, pp. 48–49. ^ Eastmond 1998, pp. 106–107. ^ a b c Eastmond 1998, p. 108. ^ a b c d e f Khazanov & Wink 2001, p. 49. ^ a b c d e f g h Suny 1994, p. 39. ^ Lordkipanidze & Hewitt 1987, p. 141. ^ a b c Lordkipanidze & Hewitt 1987, p. 142. ^ Alemany 2000, p. 321. ^ a b Lordkipanidze & Hewitt 1987, p. 143. ^ a b Eastmond 1997, pp. 111–112. ^ Eastmond 1998, pp. 135–137. ^ Rapp 2003, p. 263. ^ Luther, Kenneth Allin. "Atābākan-e Adārbāyĵān", in: Encyclopædia Iranica (Online edition). Retrieved on 2006-06-26. ^ Eastmond 1998, p. 121; Lordkipanidze & Hewitt 1987, pp. 150–151. ^ Humphreys, 1977 p. 131. ^ a b c Lordkipanidze & Hewitt 1987, p. 154. ^ Tamar's paternal aunt was the Komnenoi's grandmother on their father's side, as it has been conjectured by Toumanoff 1940. ^ Eastmond 1998, pp. 153–154; Vasiliev 1935, pp. 15–19. ^ a b Pahlitzsch 1996, pp. 38–39. ^ a b Eastmond 1998, p. 96. ^ a b Eastmond 1998, pp. 122–123. ^ Eastmond 1998, p. 122. ^ Rapp 2003, p. 413. ^ (in Georgian) Shengelia, N., საქართველოს საგარეო პოლიტიკური ურთიერთობანი თამარის მეფობაში ("Foreign Relations of Georgia during the reign of Tamar"), in Melikishvili (1979). ^ Salia 1983, pp. 177–190. ^ Rapp 2003, p. 422; Eastmond 1998, p. 135; Lordkipanidze & Hewitt 1987, p. 157. ^ In the Middle Ages, the terms "Abkhazia" and "Abkhazians" were predominantly used in a wider sense, covering, for all practical purposes, the whole of western Georgia. It was not until the 15th/16th century, after the fragmentation of the unified Georgian kingdom, that these terms resumed their original, restricted sense, referring to the territory that corresponds to modern-day Abkhazia and to the ethnic group living there. Barthold, Wasil & Minorsky, Vladimir, "Abkhaz", in The Encyclopaedia of Islam, Vol. 1, 1960. ^ "Kartvelians", the modern self-designation of the Georgians, originally referred to the inhabitants of the core central Georgian province of Kartli (Iberia in Classical and Byzantine Greek sources). By the early 9th century, the Georgian literati had expanded the meaning of "Kartli" to other areas of medieval Georgia held together by religion, culture, and language (Rapp 2003, pp. 429–430). ^ Suny 1994, p. 43. ^ Tuite 2003, pp. 7–23. ^ Suny 1994, p. 40. ^ Toumanoff 1966, "Armenia and Georgia", pp. 624–625. ^ Suny 1994, pp. 38–39. ^ Eastmond 1998, pp. 94, 108–110. ^ Rapp 1993, pp. 309–330. ^ Rayfield 1994, pp. 73–83. ^ Javakhishvili 1983, pp. 280, 291–292; Vateĭshvili 2003, p. 135 (Footnote #3; Japaridze 2012, p. 348. ^ Pahlitzsch 1996, p. 38 (Footnote #17); Vateĭshvili 2003, pp. 135–140. ^ (in Georgian) Robakidze, Grigol (13 May–15, 1918), "თამარ" ("Tamar"). Sak'art'velo 90/91. ^ Vateĭshvili 2003, p. 135. ^ a b Eastmond 1998, p. 97. ^ Rayfield 1994, p. 74. ^ Rayfield 1994, pp. 82–85. ^ Eastmond 1998, pp. 97–98. ^ Eastmond 1998, p. 98. ^ Sikharulidze 1979, pp. 167–176. ^ Dragadze 1984, p. 179. ^ Čiževskij 1971, p. 236; Suny 1994, p. 49. ^ История русской литературы, Дмитрий Дмитриевич Благой, Volume 1, p. 208. ^ Eastmond 1997, p. 116 (Note #39). ^ Vasiliev 1936, p. 13. ^ Eastmond 1997, pp. 103–104. ^ Oxfeldt 2005, p. 220 (Note #117). ^ Eastmond 1997, pp. 103–111. ^ Suny 1994, p. 290. ^ Tillett 1969, p. 329. ^ Spurling 2001, p. 96. ^ Eastmond 1998, p. 262. Alemany, Agustí (2000). Sources of the Alans: A Critical Compilation. Leiden, Boston and Köln: Brill. ISBN 90-04-11442-4. Allen, William Edward David (1971) . A History of the Georgian People: From the Beginning Down to the Russian Conquest in the Nineteenth Century (2nd ed.). New York: Routledge & Kegan Paul. ISBN 0-7100-6959-6. Čiževskij, Dmitrij (1971) . History of Russian Literature: From the Eleventh Century to the End of the Baroque. The Hague: De Gruyter (Mouton & Co., Publishers). ISBN 9789027919175. Dragadze, Tamara (1984). Kinship and Marriage in the Soviet Union: Field Studies. London and Boston: Routledge. ISBN 0-7100-0995-X. Eastmond, Antony (1997). "Gender and Orientalism in Georgia in the Age of Queen Tamar". In James, Liz (ed.). Women, Men and Eunuchs: Gender in Byzantium. London and New York: Routledge. pp. 100–118. ISBN 0415146852. Eastmond, Antony (1998). Royal Imagery in Medieval Georgia. University Park, PA: Pennsylvania State Press. ISBN 0-271-01628-0. Humphreys, R. Stephen (1977). From Saladin to the Mongols: The Ayyubids of Damascus, 1193–1260. Albany, NY: State University of New York Press. ISBN 0-87395-263-4. Japaridze, Gocha (2012). "თამარ მეფის გარდაცვალების თარიღის შესახებ [On the Date of the Death of Queen Tamar]". Saistorio Krebuli (in Georgian). 2: 348–363. ISSN 1987-7285. Javakhishvili, Ivane (1983). ქართველი ერის ისტორია, ტ. 2. (History of the Georgian Nation, Volume 2) (PDF) (in Georgian). Tbilisi: Metsniereba. Khazanov, Anatoly M.; Wink, André, eds. (2001). Nomads in the Sedentary World. London and New York: Routledge. ISBN 0-7007-1369-7. Lordkipanidze, Mariam Davydovna; Hewitt, George B. (1987). Georgia in the XI–XII Centuries. Tbilisi: Ganatleba Publishers. Melikishvili, Giorgi; Anchabadze, Zurab (1979). საქართველოს ისტორიის ნარკვევები ტ. 3: საქართველო XI–XV საუკუნეებში (Studies in the History of Georgia, Volume 3: Georgia in the 11th–15th Centuries) (PDF) (in Georgian). Tbilisi: Sabchota Sakartvelo. Metreveli, Roin (1992). მეფე თამარი (Queen Tamar) (in Georgian). Tbilisi: Ganatleba Publishers. ISBN 5-520-01229-6. Oxfeldt, Elisabeth (2005). Nordic Orientalism: Paris and the Cosmopolitan Imagination. Copenhagen: Museum Tusculanum Press (University of Copenhagen). ISBN 87-635-0134-1. Pahlitzsch, Johannes (1996). "Georgians and Greeks in Jerusalem (1099–1310)". In Ciggaar, Krijnie; Teule, Herman (eds.). East and West in the Crusader States. Leuven and Dudley: Peeters Press. pp. 35–52. ISBN 90-429-1287-1. Rapp, Stephen H. (1993). "Coinage of T'amar, Sovereign of Georgia in Caucasia". Le Muséon. 106 (3–4): 309–330. Rapp, Stephen H. (2003). Studies In Medieval Georgian Historiography: Early Texts And Eurasian Contexts. Leuven: Peeters. ISBN 90-429-1318-5. Rayfield, Donald (1994). The Literature of Georgia: A History. Oxford: Clarendon Press. ISBN 9780198151913. Salia, Kalistrat (1983). History of the Georgian Nation (Translator: Katharine Vivian) (2nd ed.). Paris: Académie française. Kuehn, Sara (2011). The Dragon in Medieval East Christian and Islamic Art. Leiden: Koninklijke Brill NV. ISBN 9789004186637. Sikharulidze, Ksenia (1979). "Rituals and Songs of Weather in Georgian Poetic Folklore". In Blacking, John A.R. ; Keali'inohomoku, Joann W. (eds.). The Performing Arts: Music and Dance. IXth International Congress of Anthropologica. The Hague, Paris and New York: De Gruyter (Mouton Publishers). pp. 167–176. ISBN 90-279-7870-0. Suny, Ronald Grigor (1994) . The Making of the Georgian Nation (2nd ed.). Bloomington and Indianapolis: Indiana University Press. ISBN 0-253-20915-3. Spurling, Amy (2001). "The Georgian Literary Scene". PEN Bulletin of Selected Books. 51–53: 96. Tillett, Lowell (1969). The Great Friendship: Soviet Historians on the Non-Russian Nationalities. Chapel Hill: University of North Carolina Press. Toumanoff, Cyril (1966). "Armenia and Georgia". The Cambridge Medieval History (Volume 4). Cambridge: Cambridge University Press. pp. 593–637. Toumanoff, Cyril (July 1940). "On the Relationship between the Founder of the Empire of Trebizond and the Georgian Queen Thamar". Speculum. The University of Chicago Press. 15 (3): 299–312. doi:10.2307/2855207. JSTOR 2855207. Tuite, Kevin (2003). "Political and Social Significance of Highland Shrines in Post-Soviet Georgia". Amirani. 9: 7–23. Vasiliev, A. A. (1935). Byzance et les Arabes, Tome I: La Dynastie d'Amorium (820–867) (in French). French ed. : Henri Grégoire, Marius Canard. Brussels, Belgium: Éditions de l'Institut de Philologie et d'Histoire Orientales. pp. 195–198. Vasiliev, Alexander (January 1936). "The Foundation of the Empire of Trebizond (1204–1222)". Speculum. The University of Chicago Press. 11 (1): 3–37. doi:10.2307/2846872. JSTOR 2846872. Vateĭshvili, Dzhuansher Levanovich (2003). Грузия и европейские страны. Очерки истории взаимоотношений, XIII-XIX века. Том 1. Грузия и Западная Европа, XIII-XVII века. Книга 1. (Georgia and the European Countries: Studies of Interrelationship in the 13th–19th Centuries. Volume 1: Georgia and Western Europe, 13th–17th Centuries. Book 1.) (in Russian). Moscow: Nauka. ISBN 5-02-008869-2. Wikimedia Commons has media related to Tamar of Georgia. Georgian coins minted in Tamar's reign, Zeno – Oriental Coins Database. This page was last edited on 15 April 2019, at 18:24 (UTC).